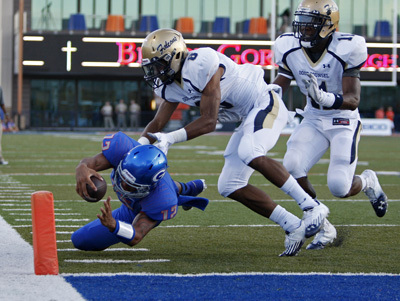 Bishop Gorman’s football team could have let the pressure get to it on Friday night. After all, it was the home opener on national television against a nationally ranked opponent. Instead, the Gaels came out and took control from the beginning, scoring on their first drive on the way to a 27-22 win over Our Lady of Good Counsel (Md.). Gorman marched 82 yards on six plays on its opening drive, capped by a 27-yard scoring pass from Jarrett Solomon to Ryan Smith. Solomon saw that Smith had beaten his defender and lofted the ball over the top of the defense for the score. It wasn’t the last time the two would hook up in the game. Solomon found Smith open on the left sideline, and the speedy receiver raced down the sideline for a 70-yard scoring pass to put the Gaels up 27-8 with 5:10 to go in the third quarter. 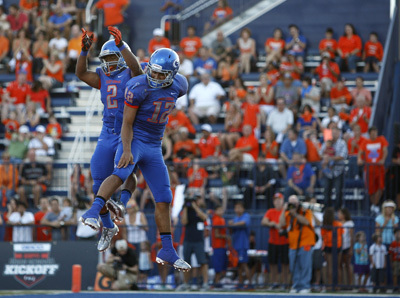 Solomon and Smith are in their fourth season working together in Gorman’s offense. Smith finished with three catches for 100 yards. Solomon was 13-for-17 for 241 yards and three touchdowns. He also had a 9-yard scoring run with 9:43 to go in the first half to put the Gaels up 14-8. A pair of second-half fumbles by running back Tajon Allen helped keep the Gaels from pulling away. And Dorian O’Daniel, who has committed to play at Clemson, scored two second-half touchdowns for the Falcons. His 3-yard touchdown run cut Gorman’s lead to 27-15 with 48 seconds left in the third quarter. Then Good Counsel, ranked No. 9 nationally by Rivals.com, got a 22-yard punt return from Kendall Fuller to give the Falcons the ball at the Gorman 38 with 3:34 to play. Three plays later, O’Daniel scored on a 1-yard run to make it 27-22 with 2:05 to go. 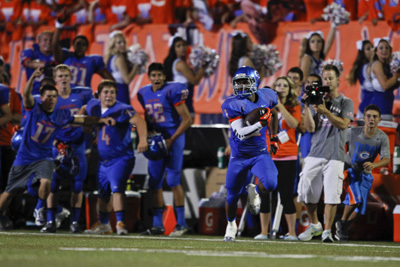 But the onside kick attempt went out of bounds, and 27th-ranked Gorman ran out the clock. “We didn’t look sharp at the end with some of the turnovers,” Sanchez said. “We got a little lethargic. We’ve got to clean some things up. Gorman limited Good Counsel to 38 yards rushing in the first half, but O’Daniel got going in the second half, finishing with 127 yards and three touchdowns on 23 carries. “When you play a team that’s got that many weapons and that many good kids, you’re kind of naive to think you’re going to completely stone them,” Sanchez said.